There may be many trendy decors available in the markets but something which pops out from waste is really worth and interesting . Waste management is even good for our environment. The key for the swinging is the semi circular shape of the stand , you may opt any shape like melon piece , pumpkin , swan , bird, or a tomato any structure of your taste which is in semi circle . 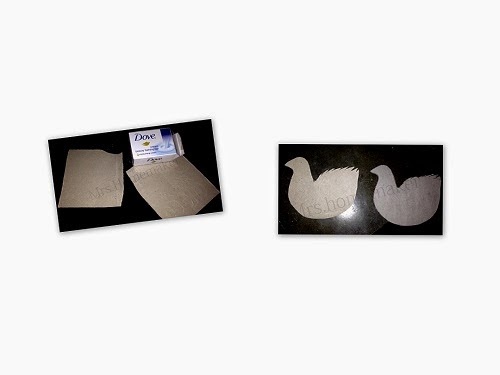 First trace the shape with the stencil or with free hand on taken card board . Cut it along the traced border , make one more trace and repeat the cutting to prepare the two sides of the holder. Now select two contrast pattern papers of your choice and trace the pattern on them and cut along the traced border. Take the small box shaped carton and remove one side completely for a opening, and glue the other ends without any loose contacts. Now stick the cut patterned papers to the cardboard and let them dry. Decorate them with the beads or kundans or pearls or even with colors and then attach the two sides to the soap box such that the box hides in between them . The shape is very important for swinging , so be careful while tracing and cutting . The sizes of both sides must match otherwise the holder may not swing or stand . The sizes of the sides must be larger than the box, so that the box sits and hides in between them . I enclosed a video , it did not turn out that good but it gives you an idea how this holder swings . Good Luck and play with your imagination.